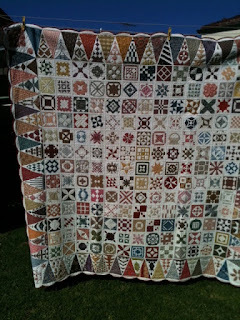 Our next presenter at the always popular NSW Quilters' Guild Inc 'Friday Showcase' will be veteran quilter Pam Curtis. Pam was bitten by the 'bug' in 1991, after the usual years of family sewing. Teacher Shirley Gibson influenced Pam to take further lessons after the ubiquitous 'Sampler Quilt', and what followed has became more than 20 years of belonging to various P&Q groups, with continual perfection of this craft. Within 10 years Pam began to win prizes at the Sydney Quilt Shows with her hand pieced and hand quilted 'traditional' quilts often made with an abundance of wonderful scraps. Pam's 'Dear Jane' - Hand pieced and hand quilted. A prolific quilt maker, Pam has several 'on the go' at the one time, all at various construction stages. She refers to her UFO's as "Sleeping Beauties"...what an excellent moniker ! Come and see first hand, Pam's finished quilts. 'Quilts 1700-1945' is an exhibition featuring works from London's prestigious Victoria and Albert Museum, as well as loans from other selected UK museums. Of special importance will be the inclusion of The Rajah Quilt 1841, from the collection of the National Gallery of Australia, Canberra. It will be wonderful to view this immensely historical quilt in relation to the concurrent quilts that were being made in England. Vist the website to obtain further details about the full schedule of programmes and events planned. A big "thankyou" to Mike R, The Quilt Show is indebted to Mike and many other unheralded "friends - of" quilters, who graciously help their "better halves" and the whole Guild with specialist and time consuming tasks during the Show. The combined wisdom, speed and general mad-hattedness of The Kedumba Kuilters (otherwise known as Leisel, Wendy, Kerry and Veteran Leader- Isobel ) ensured a closely won race with the Jelly Roll. There are moves 'afoot' to have these three teams in a play-off Jelly Roll Race at next year's Quilt Show. 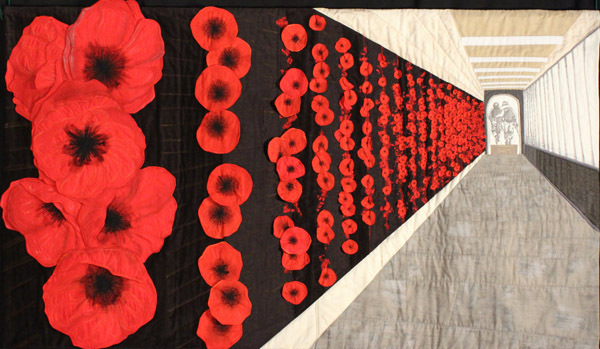 Artist Statement: This quilt supports Soldier On (www.soldieron.org.au), a charity which provides support for defence members wounded in recent conflicts. It commemorates our friends lost in Afghanistan. My husband is currently serving there on Op Slipper, and he returns home in July. 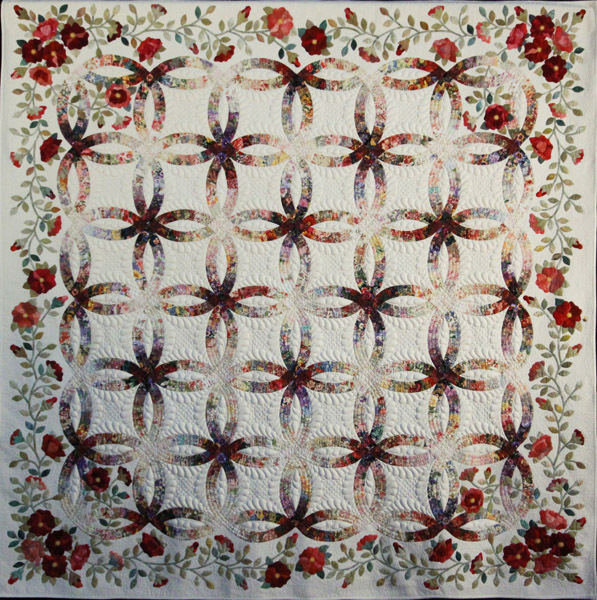 Second prize for Viewers' Choice was awarded to Janet Treen for her Best of Show quilt Rings & Roses. You can view more of Lucy and Janet's work on their websites www.lucycarrolltextiles.com and www.quiltsalott.blogspot.com View all of the prize winning quilts in the Sydney Quilt Show 2013 Prize Winners's Gallery. 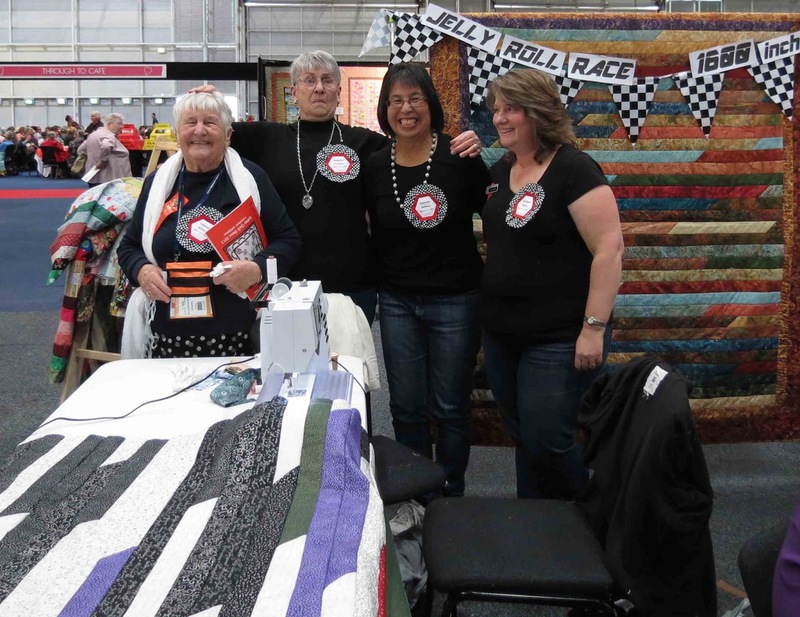 The President of The Quilters' Guild of NSW Inc, Cath Babidge, reports that due to the unfailing enthusiasm of the many members volunteering in numerous and varied spheres, this year's Sydney Quilt Show was a resounding success. She wishes to thank everyone, members, partners and friends, and especially the Exhibition Sub-Committee for their hard work in presenting such a wonderful week of quilting display and events. She and the Guild are also extremely grateful for the continued support shown from the many Sponsors, who through their ongoing generousity facilitate a wider recognition of the importance of quilting and related textile arts. "Thankyou, and Congratulations" to all involved. There is only one day left to enjoy the visual delights of this year's Quilt Show. All attendees have been treated to an outstanding display of quilts, talks and information sessions, and quilt fun from guild members, as can be seen from the following snaps. Suzanne Gummow and Julie Haddrick, members of SAlt, a creatively dynamic group of 5 Textile Artists, conduct daily talks about quilts made following individual explorations of a "Journeys" theme. Immediate Past President, Maree Gebhardt illustrating the intricacies of the phenomenal quilting skills of the late Narelle Grieve, at a retrospective special exhibit. Some of the many members, including the current President Cath Babidge, who volunteer their time to instruct novices on quilt construction techniques. Past President Lynn Hewitt proudly "White Gloving" at her grand daughter, Lauren Roach's prize winning entry "Blue Bird" in the Junior Member (up to Year 6) section. They may appear as friendly rivals here, but "The Senior Moments", The Lone Quilter", and "The President's Princesses" were soon competing furiously in one of the Jelly Roll Race Quilt competitions. The PP's won this particular round! With a whole day left to "run", the 2013 Sydney Quilt Show promises to delight and inspire all who attend. See you at Darling Harbour! The Guild website has been updated! 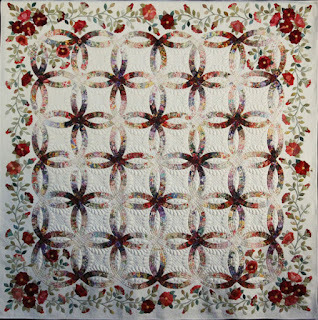 You can see images of all of the prize winning quilts in the Sydney Quilt Show 2013 Prize Winners Online Gallery. Sydney Quilt Show Photography Policy: Quilt photography is permitted for personal use only. Images must NOT be published online or in other media unless you have the consent of the relevant quilt maker. This means you must not post quilt images from the show on Facebook, Instagram or other social networking sites unless you have the consent of the quiltmaker. Rings and Roses by Janet Treen has won this year's Best of Show. 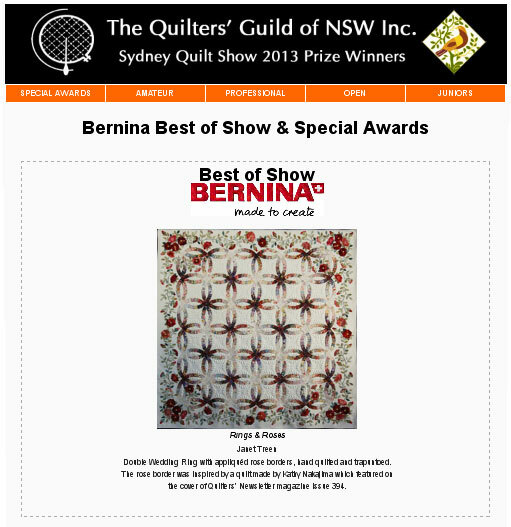 The 2013 Sydney Quilt Show Prize Winners Gallery will be updated on the Guild's Website during the course of the Show. 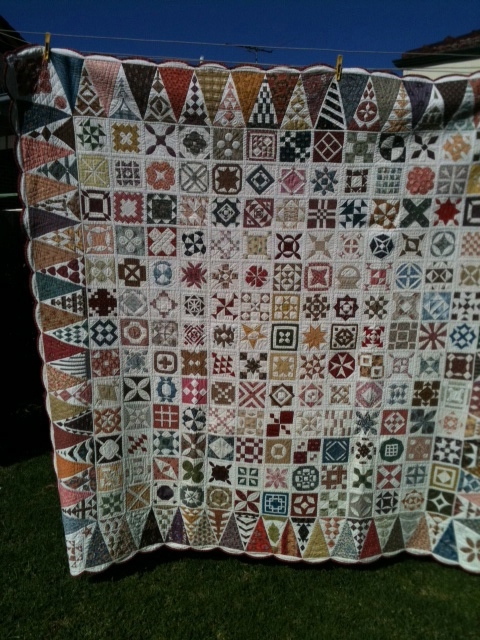 The Guild link will provide images and information on the prize winning quilts in all categories. The Viewers Choice prize will be announced at the completion of the Quilt Show. Did you know that you can renew your membership to The Quilters' Guild of NSW whilst at the Sydney Quilt Show next week? At the Guild's Information Table there will be banking facilities to make your renewal easy if membership fees havent yet been mailed in to the Guild Office. Payment is required now from all current members to ensure continuity of membership. "The Colours of Australia" will be a highlight at the 2013 Sydney Quilt Show. These quilts were made for a 1995 exhibition and are now to be viewed once more. Floor talks are to be conducted and all are invited to attend. SAlt : South Australian living textiles : "The Fabric Trail"
This is a travelling exhibition created by a group of 5 South Australian contemporary Textile Artists. They have produced 8 works each, exploring themes relating to "Journeys" and two of the artists, Julie Haddrick and Suzanne Gummow will talk about this exhibition. 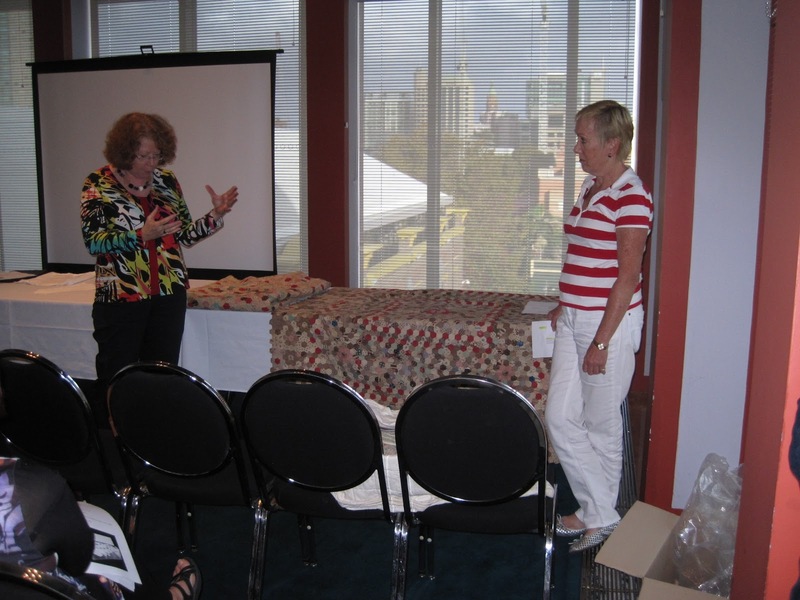 A wonderful display of quilts created by the late Narelle Grieve has been curated by Maree Gebhardt. Maree will speak about Narelle's quilts at 11am each day, Thursday through to Sunday. Quilt Show Countdown : Join the Jelly Roll Racers! Template Free on May 21st called for enthusiastic quilters to join forces for a "Jelly Roll Race Quilt" demonstration to be held during the 2013 Sydney Quilt Show. Themed teams are already preparing their strips, sharpening their scissors and filling their bobbins, so make sure you come and watch the frantic attempts to outdo each other during the marathons at the sewing machines! Come and cheer on the teams and watch Jelly Roll quilt tops come together. Following the fantastic response to Beneath the Southern Sky, Brenda Gael Smith is curating another travelling textile art exhibition in 2014/2015 that will premier at the Australasian Quilt Convention in 2014. This is an invitation to all textile artists to submit an entry exploring the theme Living Colour! Each work will be in a 100x40cm (L x W) vertical format and up to 30 works may be selected. To submit an entry, please review the Conditions of Entry and complete the Online Entry Form. The closing date for entries is 31 January 2014. International entries are welcome. Lisa Walton, Business Woman and textile entrepreneur, Art Quilter, Educator, Designer and Author; 2010 Jewel Pearce Patterson Scholar, and recipient of many Quilt Exhibition prizes, has recently been appointed to the Board of the prestigious SAQA, whose members hail from around the world. May this new path bring much joy to a very creative and inspiring quilter. The QSG Meeting on Sat May 12th allowed members to enjoy a most interesting and comprehensive talk from Jennifer Palmer regarding how owners can document and store, care for and conserve quilts for the best future outcome. Provenance of a Quilt is extremely helpful for changing insurance purposes, and for the education of further owners, admirers and scholars. As has been observed by many a quilter, the history of a quilt, its creator, fabric and design details, its "journey", offers fascinating glimpses into textile and historical past. Jennifer shared many important contact details about conservation products and suppliers as well as valuable information about the Australian environment and appropriate pest management techniques. She also had documentation and description pointers for any quilter wishing to record their quilts, and carefully explained exactly what should be recorded and why. Jennifer Palmer sharing quilt conservation information. 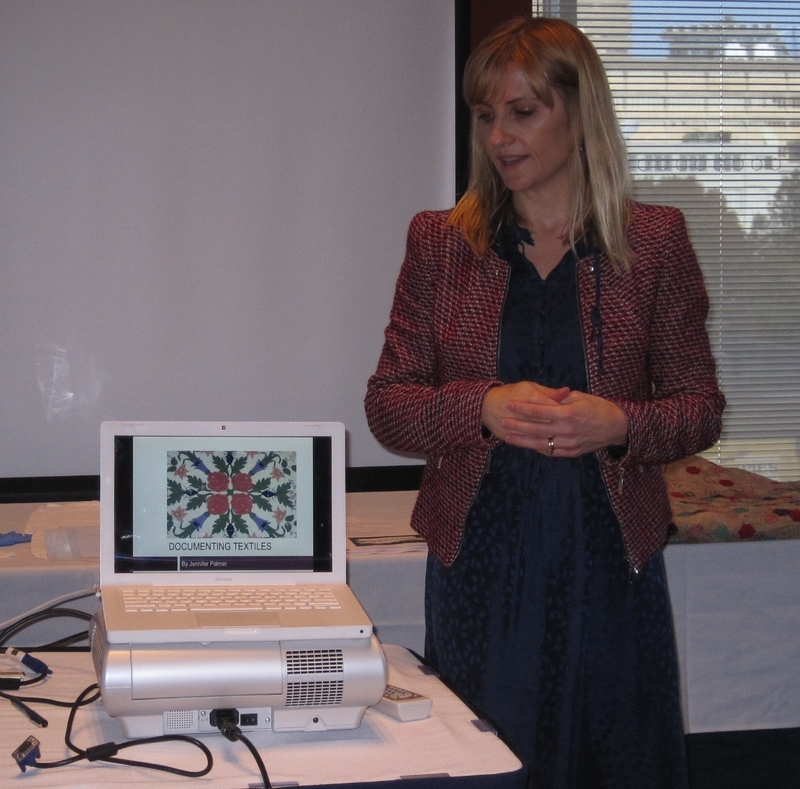 During this session, Dr Annette Gero reinforced the concept of notated quilt history, and illustrated her talk with a showing of the Mary Moorehead hexie Quilt circa 1880's. 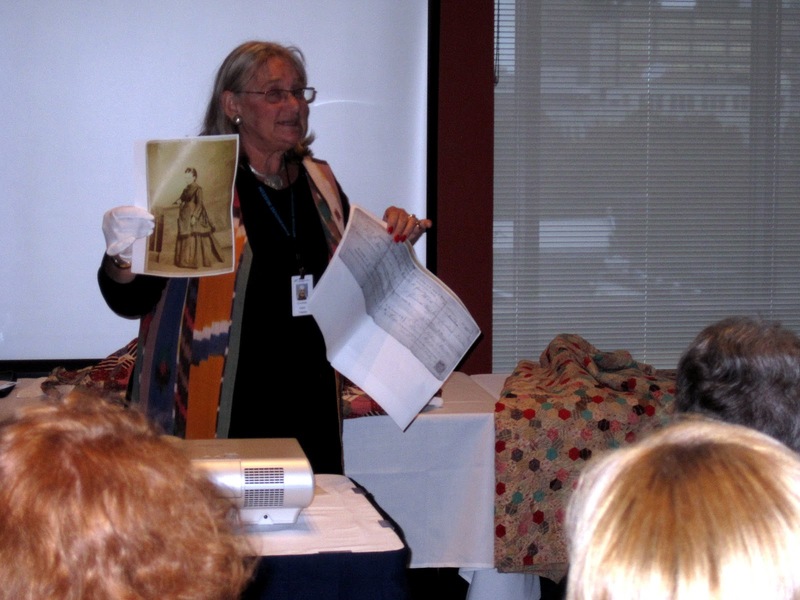 Her research into fabrics has been able to collaborate or disprove oral family quilt histories. She is equally passionate about the need for the documentation of every quilt made. Dr Annette Gero illustrating how family history is important for authentic quilt documentation. Anne Seddon shared some family history with the quilt and story behind her wonderful 1880's quilt, still replete with hexie papers. Karen Fail also showed a quilt : a modern one made by Lorraine Scouler, subsequently purchased from the Scouler family after the death of this close friend. That quilt's story is included in a book, with details now available for posterity. A more detailed report from the QSG May meeting will be published in the next Template.